Trendy tots will look divine as they play upon this stylish baby gym setup. These are high quality baby products that don’t compromise on style and won’t break the bank. We recently featured the gorgeous and colourful felt ball garland made by Nin and June, but noticed their Etsy store has a few more handmade beauties that you might love. 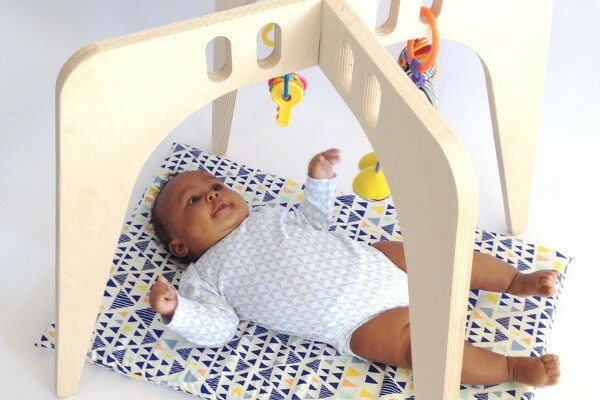 This stunning wooden baby gym is crafted from Baltic birch plywood. It has a lovely minimalist Scandanavian aesthetic that perfectly suits the modern home. Baby gear that doesn’t mean compromising your style? Love it. Eight spaces at the top allow you to hang a variety of toys to entertain your wee one. The gym also comes apart easily for storage. Of course, if bub is going to lie under their gym then they will need a soft rug to lie upon. 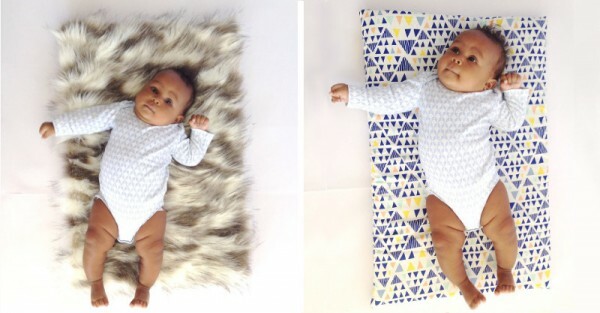 Nin and June make gorgeous baby mats with soft memory foam to gently cradle little bodies in comfort as they play. A variety of design options are available, from on trend geometric patterns to a classically luxe faux fur. All Nin and June products are made to order so delivery time might be a bit longer than usual, but it sure is worth the wait. You can see their full selection at Nin and June and on their Etsy store.